Metro Vancouver’s biggest annual restaurant festival returns on January 18, offering a belt-busting 17 days of tempting prix fixe deals at more than 300 local eateries. Launched in 2002, Dine Out Vancouver is always one of the most anticipated events in BC’s foodie calendar—and restaurants across Richmond are once again enthusiastic participants in this latest edition of the festival. Reputedly Canada’s largest celebration of food and drink—with more than 100,000 hungry diners taking part every year—the festival’s foundation is its fixed price dining menus. Typically including three courses, restaurants offer special menus at $15, $25, $35 or $45 price points, with some offering more than one price category. There are usually several choices available for each course, often including a vegetarian dish. Most are dinner-only menus, but some restaurants also offer lunch as well. If you’re a wine lover, some menus include BC wine-pairing suggestions. In Richmond, 20 restaurants are taking part in the 2019 Dine Out Vancouver festival. Reservations are now open, and you are encouraged to book directly with each eatery as far ahead as possible to ensure you snag seats at your top choice restaurants (and on your desired days). Hungry? Read on to discover what’s on the menu in Richmond. There are a wide array of Richmond options to consider in this culinary category. 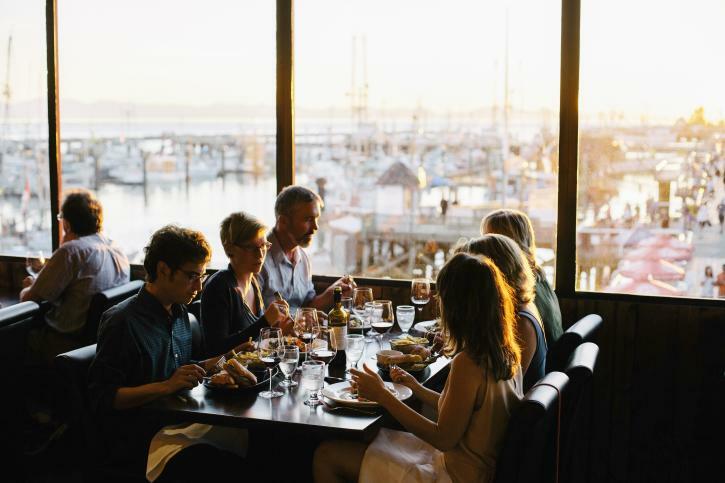 At the $45 price point, entrée choices at American Grille include lamb loin, ling cod or duck confit papardelle, while options at Steveston’s Blue Canoe Waterfront Restaurant include crispy skin salmon, pan-seared Arctic char or beef striploin with sautéed shrimp. Over at Tramonto, the $45 menu offers delicious lamb, cod or chicken options—plus a special three-course vegetarian line-up. And don’t forget: these prices include starters and desserts as well. In the $35 category (also three courses), the Apron is serving up five spice chicken, steelhead trout or pumpkin spiced risotto main course options, while choices at Catch Kitchen + Bar include a couple of firm favourites: surf + turf or a seafood medley. There’s an Asian fusion approach over at the Deck Kitchen + Bar, with options such as char siu pork hock shank or clam and duck ragu. And Harold’s Bistro & Bar is also keeping things interesting, with prawn and chicken laksa among its entrée choices. And while Cactus Club Cafe is offering its $35 menu as both a dinner and a lunch option—entrées include steak frites or hunter chicken—CAVU Kitchen & Bar has created two separate menus for each meal. Their $35 Dine Out dinner includes a tempting Nashville hot style fried chicken, sous vide pork or BC rockfish entrée choice—while their $15 lunch menu includes a roast turkey club, avocado toast or fried chicken, plus a soup or salad appetizer and dessert. In the $45 category and you’ll find an unusually large array of main course choices at Carver’s Steakhouse, including sirloin steak, barbecued pork ribs, maple-glazed salmon, or peppercorn New York steak. In the same price range, the Keg Steakhouse + Bar offers steak, rib, or salmon choices, while Chop Steakhouse & Bar’s $45 dinner menu is equally tempting. Chop is also serving up a $25 two-course lunch menu: prime rib and frites recommended. In the $35 category, the Boathouse is serving fire-grilled sirloin, coconut cod or shrimp and chorizo risotto entrées, while the Shoestring Cafe is offering pan roasted duck breast, grilled blackened steak or miso black cod entrée options. There’s also a tempting three-course $25 menu to dive into at Shady Island Seafood Bar & Grill, including fish and chips, curried prawns or butternut squash ravioli entrée choices. Many bars and pubs, of course, take their food menus very seriously. And two local favourites have stepped up to participate in Dine Out this year. The three-course $25 dinner menu at the Flying Beaver Bar & Grill includes barbecue pork ribs, blackened chicken or prawn linguini entrée options. And in the same price range, Milltown Bar & Grill is offering main course choices of tuna poke, bone-in pork chop or lobster ravioli—don’t miss their churros with Guinness caramel for dessert. Richmond, of course, also has a celebrated Asian dining scene. And there are three restaurants to discover during the Dine Out Vancouver festival. Along with its $35 three-course dinner menu (go for the masala halibut), there’s also a bargain $15 lunch at Ember Indian Kitchen, including tandoor chicken or fish curry options. At Yokohama Teppanyaki & Sushi Bar, there’s a $35 dinner menu and a $25 lunch menu, each suffused with chicken, beef or seafood options. And over at Hotpot Palace, the simmering $35 Dine Out dinner is only available to those seated at the bar. But your feast-like options include a choice of meat (including AAA Angus beef), choice of broth, seafood of the day, and vegetable platters. The Dine Out Vancouver festival runs from January 17 – February 3, 2019. For more information on Dine Out Vancouver, including restaurant menus and booking information, visit the festival’s website.